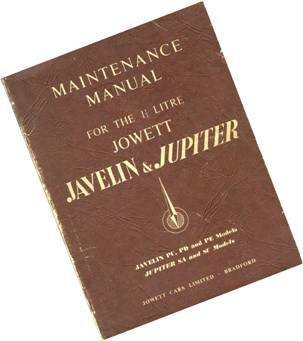 Jowett Javelin and Jupiter Maintenance Manual and Jupiter Handbook. It should be carefully noted that these Technical Data sections have been taken from a wide range of sources. Every effort has been made to maintain accuracy and consistency of information in this part of the Technical Notes Series. Some of the information has been taken from very old and faded documents. 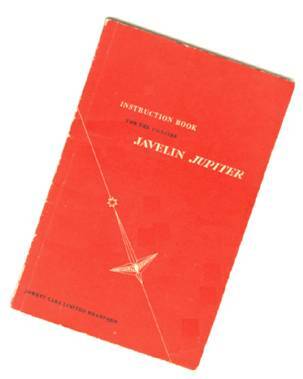 It is very likely that this is the first, and most comprehensive, document that contains both Javelin and Jupiter technical data. This document does not claim to be absolutely up to date. 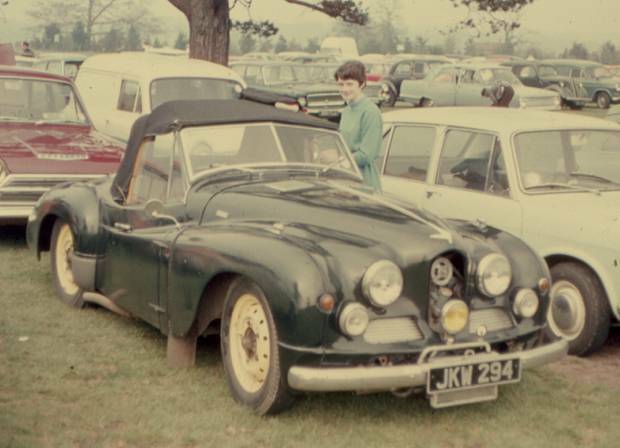 Jowett Javelin and Jupiter information is continuing to be found and there will, no doubt, be updates in the not too distant future. It is vitally important that technical and service information be kept by the Jowett Car Club of Australia Inc. for future use by Jowett enthusiasts. An attempt was made to combine the two Jowett models into one comprehensive section. However, even though the base running gear is the same (and similar to) the Javelin, it was found best to have one section each for each of these Jowett models. The Javelin comes first with the Jupiter section commencing on Page 18. Please make good use of this Part XXV of the Technical Notes Series. Mike Allfrey – January, 2007. Jowett Javelin from a pre-production sales brochure. Compiled by Mike Allfrey – 1998.. This document is the result of an attempt to combine all technical data relating to the Jowett Javelin saloon. Some data has been taken from the Auto Trader Service Data No. 208, dated August 26th. 1953, some is from Scientific Magazines Publishing Co., 1952. Some original information has been taken from the Maintenance Manual, published by Jowett Cars Limited. All later information sourced from the Jupiter Owners Auto Club, Jowett Parts (NZ) and local experience. Every effort has been made to maintain accuracy of information. However, due to the Jowett Car Club of Australia Incorporated having no influence on the content of this document nor the changes which may happen, responsibility cannot be accepted by the club for any errors and/or changes. This is stamped on to a raised plinth which is located on the left hand side front face of the crankcase. It is the same number as the chassis number (Serial Number). Reconditioned engines have a riveted identification plate located on the rear top surface of the crankcase adjacent to the clutch housing and starter motor pinion. These are stamped on to a brass plate which is fastened to the upper left hand side of the dash (firewall) and can bee seen after raising the bonnet. Nearby, close to the bonnet hinge, is a plate showing the Briggs Body Number. It should be noted that there is also a chassis number stamped directly into the body frame at the bonnet catch cross member above the grille. E = 5 Being the first digit of the decade. ‘A’ = 1, ‘B = 2, ‘C’ = 3 and ‘D’ = 4. 1 = 1 Being the year in the decade. C = Third build series. ‘A’ = First series, ‘B’ = Second series. 12778D = The individual vehicle number. The above describes a right hand drive vehicle, if it had been left hand drive the Serial Number would have been E1/PCL/12778D. Note: Early engines had two Zenith 30VM-4, later engines 30VM-5 carburettors. The Jowett Competition Tuning Notes booklet suggested use of 30VM carburettors as used in the later Jupiter. Centrifugal (Crank Deg.) 18 – 22 deg. 18 – 22 deg. Cam Angle (Closed Period) 49 ± 4 deg. 60 ± 3 deg. Degrees and rpm are quoted at the distributor, and both should be doubled to arrive at the equivalent measured at the engine crankshaft, shown above in brackets. Diameter 2.25 in. 2.25 in. 2.25 in. 2 in. Length 1.25 in. 1.25 in. 1.391 in. 1 in. Crankshaft End Float Main Bearings: 0.003 – 0.004 in. Big Ends: 0.004 – 0.008 in. Journal Under Sizes 0.005#, 0.010, 0.020 in. Permissible Runout 0.003 in. (0.0762 mm) At rear face of flywheel. * Theoretical interference becomes positive clearance in running conditions. # 0.005 in. undersize not available for big ends. When grinding the crankshaft at main and big end bearing journals, particular care should be taken to ensure that a suitable radius (0.100” [2.54 mm]) is ground at the journal fillets. Total ovality and taper of each journal should not exceed 0.002” (0.0508 mm). At the journals there must be a high surface finish, with a maximum surface roughness of 12 micro inch. The spigot end of the crankshaft, where rear main oil seal runs, MUST NOT BE GROUND. This is the spigot for flywheel location. Certain precautions are necessary when nitriding Laystall oval-web crankshafts. This note has been taken from a letter from Laystall Engineering Co. Ltd., London in 1970, following a query from a club member who had a shaft reground to within limits specified and then nitrided. Two main bearings were outside limits, and the crankshaft was too stiff to turn after assembly. Note: A photocopy of these pages should be handed to whoever is grinding the crankshaft. Over Sizes available 0.010, 0.020, 0.030, 0.040 in. Ring Gap in Cylinder 0.007 – 0.015 in. 0.007 – 0.015 in. Side Clearance in Grooves 0.0015 – 0.002 in. 0.0015 – 0.002 in. Camshaft End Float With engine stopped. To adjust – screw adjusting screw in to light contact with the camshaft, then back off one eighth of a turn and tighten lock nut while holding adjusting screw in set position. ã Cooling system should be drained, flushed and filled with fresh mix of corrosion inhibitor or antifreeze at two year intervals. Top-up coolant should be thoroughly pre-mixed as indicated above. Use corrosion inhibitor when temperature does not drop below 0 ºC. Do not mix products. Big End Bolts 0.375 in 35 lb.ft. Crankcase Through Bolts 0.5625 in. 75 lb.ft. * Short thread into oil gallery, drilled stud. ** For cylinder liners on solid copper shims. “. . . Cylinder head torque wrench setting now reduced to 450 inch-lbs.” This figure of 37.5 lb.ft. in applying to ‘O’ ring liner engines is also relevant to the present practice of using copper liner seals. Normal Load on Spring .Arm 672 lbs. Normal Load on Spring Arm 712 Lbs. Wheel Deflection at Normal Load 6.5”. Colour – Amber. AS1960-1983 Grade 3. Component Summary: Model No. Part No. * Offset pins for bayonet. Lock Torque 9.3 lb. ft.
1. Stiffer crankcase and enlarged oil ways to improve oil flow to main and big end bearings. Crankcase can be identified by ‘3’ stamped on upper front face of RHS casing. Also internal cross webbing to stiffen main bearing webs. Enlarged area above longitudinal oil galleries. Final crankcases had rear cylinder head studs screwed through coolant inlet ports. 2. Large radii crankshaft with or without lightening holes. 3. Adjustable camshaft thrust pad. 4. No splash protection plate on cylinder head (which necessitated the fitting of the latest sparking plug water proofing modifications). The combustion chamber was polished and slightly modified in shape. 5. Improved engine oil pump, upper housing changed to lower the pump body closer to oil level. Oil pump now featured relief valve venting to suction side of pump. Relief valve adjustable. Delivery pipe enlarged. 6. The fitting of an improved type rear timing cover with larger oil cooler banjo fittings. Jowett Engineering advised in 1960 that, if the engine number is prefixed with the letter ‘R’, it indicates a factory replacement unit. In order to clarify the position regarding replacement engines, it can be said that any engine bearing a number later than ‘R’ 10,000, will be the equivalent of a Series III engine. The following shows reconditioning practice since Series III engines were introduced. 1. In the instance where a pre-Series III crankcase is used, machined work is carried out in a number of places on the crankcase to improve the flow of oil to the main bearings, and as a consequence, to the big end bearings. The cylinder head stud holes in the crankcase are counter bored and the crankcase machined and fitted with new type oil gallery plugs. By these means most of the benefits of the Series III crankcase are obtained. 2. Nothing earlier than a Series III crankshaft is fitted, in fact all present engines are fitted with an improved shaft i.e. Blacksided or Oval-Web. 3. All reconditioned engines are fitted with the adjustable camshaft thrust peg. 4. Cylinder head combustion chambers are being polished and modified. 5. Improved engine oil pump base with adjustable relief valve features. In many cases the pump with extended body is fitted. All pumps are tested to a higher standard than was originally used in production of Series III engines. 6. All reconditioned engines have the improved rear timing case cover fitted. Jowett Jupiter – 1950. Photographed in summer 1968. This document is the result of an attempt to combine all technical data relating to the Jowett Jupiter sport scar. Original data has been taken from the Auto Trader Service Data No. 208, dated August 26th. 1953. Some original information has been taken from the Maintenance Manual, published by Jowett Cars Limited. All later information sourced from the Jupiter Owners Auto Club, Jowett Parts (NZ) and local experience. Every effort has been made to maintain accuracy of information. However, due to the Jowett Car Club of Australia Incorporated having no influence on this document nor the changes which may happen, responsibility cannot be accepted by the club for any errors and/or changes. This is stamped on to a raised plinth which is located on the left hand side front face of the crankcase. These are stamped on to a plate which is fastened to the right hand side front wing apron. It should be noted that there is also a chassis number stamped directly into the chassis frame at the radiator mount tower (early cars) or on the left hand bonnet catch bracket on the chassis front cross member. 0 = 0 Being the year in the decade. A = First build series. ‘A’ = First series, ‘B’ = Second series. 42R = The individual vehicle number. The above describes a right hand drive vehicle, if it had been left hand drive the Serial Number would have been E0/SAL/42R. The second series was identified by having ‘SC’ within the Serial Number and that model was described as the MK Ia. There was a third series, the R4 that was to have been introduced, but did not reach full production. Theoretical interference becomes positive clearance in running conditions. # 0.005 in. undersize not available for big ends. ã Cooling system should be drained, flushed and filled with fresh mix of corrosion inhibitor or antifreeze at two year intervals. Top-up coolant should be thoroughly pre-mixed as indicated above. * Castor and camber measured with spring arm horizontal. Set out below is a listing of the Lucas part numbers for components manufactured by Lucas and installed in Jowett Jupiter motor cars from 1951-54. It would be a good idea to make a copy of these pages and take them with you to swap meets etc. so that Lucas parts, if still in their boxes, can be easily identified. Those items marked with an asterisk are Lucas components that have been superseded since Jowett Jupiters were in production.